It seems nobody wants George Washington to have a birthday anymore. Or ever. 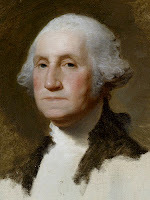 George Washington was born on February 11, 1731. At least, as they used the calendar at the time. Great Britain and its colonies used the Julian calendar then, and the new year didn't begin until March 25. Weird, right? Then, in 1752, Great Britain adopted the Gregorian calendar. That moved New Year's Day to January 1, in addition to causing a refiguring of dates. Among the changes was that February 11, 1731 became February 22, 1732. Only, folks weren't done messing with George Washington's birthday. You see, 1879, the United States added Washington's Birthday as its fifth national holiday, joining New Year's Day, Independence Day, Thanksgiving Day, and Christmas Day. Other days were added along and along. In the late 1960s, there came a movement to make federal holidays fall on a Monday. In 1971, that was made to happen for four of the nine federal holidays. New Year's Day, Independence Day, Veterans Day, Thanksgiving Day, and Christmas Day kept their actual dates. But Washington's Birthday, Memorial Day, Labor Day, and Columbus Day were moved to Mondays. When Birthday of Martin Luther King, Jr. was added -- and yes, that's the actual name of the holiday -- it, too, was designated as a Monday. All of the Monday holidays fall on the Monday nearest the actual date, except one: Washington's Birthday. It's the third Monday of February, which means it can fall as early as the 15th, but never after the 21st. In other words, Washington's Birthday will never fall on Washington's birthday. In the last several years, there has been a diminishing of George Washington by people calling his birthday "Presidents Day." Well, it's not. Now, it's true that some states used to celebrate Lincoln's birthday (February 12) as a state holiday, and have combined Lincoln's birthday and Washington's birthday into one observance. But, that's only for some states. The U. S. holiday on the third Monday in February is Washington's Birthday. Take a look at United States Code 5 U.S.C. 6103 and see for yourself. It's been rough for George Washington's birthday, officially and unofficially. First, they move his birthday from February 11 in one year to February 22 in another year. Then, they make it on a Monday that will never match the actual date. Then, they call it something else. Do some people hate George Washington? Maybe so, After all, he did help secure the blessings of liberty and help found these United States. I think he deserves his birthday to be called by its proper name. If you hear anyone call it "Presidents Day," you have my permission to beat them around the head with a stick. Two, if you think they really need it.